The word dementia comes from the Latin (de) meaning “apart” and (mentis) meaning “mind.” Yoga comes from the Sanskrit root “yuj” “yoke, join, or union,” and is perfectly designed to help bridge the mind and body together by using the breath. 10 minutes of relaxation and guided visualization. The trial run on nine adults, 65 years of age and older (34% men) who were members of a dementia day care center, attended the classes. The 9 participants demonstrated a consistent and statistically significant increase in their balance control from the beginning to the end of the yoga program. Participants did demonstrate consistent improvement in gait speed from pre-test to week 8. Not all memory loss is dementia. Beginning around age 30 we begin to experience mild memory problems such as where you placed your keys, or what you did last weekend for fun. Severe memory loss exhibits behaviors such as an inability to understand the use of keys or becoming disoriented in a previously familiar environment. 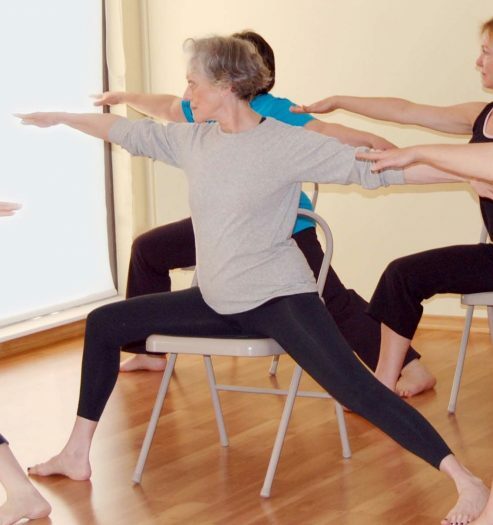 Any “asana” or yoga pose can be adapted to a chair.